There are numerous advantages to a lacquer finish. Lacquer is clear and durable and dries very quickly. It is also relatively easy to apply and comes in both spray and brushable forms. By hand-rubbing your lacquer finish, you can take it one step further and give it a mirror-like shine. Hand-rubbing also removes dust nibs (the inevitable dust particles picked up during the finish application) and brush marks and other surface imperfections. Sand your raw woodworking project using progressively finer grits of sandpaper, then remove all of the sawdust to prepare for finishing. Begin by first applying a pre-stain conditioner. You can also create your own type of pre-stain conditioner by mixing one part shellac with five parts denatured alcohol. Either of these products will seal the wood and give the stain a more even color. If you choose to use the shellac sealer, sand the project lightly with 400-grit sandpaper to remove any ridges or high spots that may have been left behind. Wipe the project with a tack cloth to remove all dust. Next, apply the stain of your choice, following the instructions on the stain container. Allow the stain to dry for 24 hours. If another coat or any other staining is required, complete those steps before moving on. With the staining completed, apply a light coat of lacquer to the entire project. Spraying is the traditional method of applying lacquer, but brushable lacquer is an acceptable alternative, although it can be a bit more temperamental than spray lacquer. 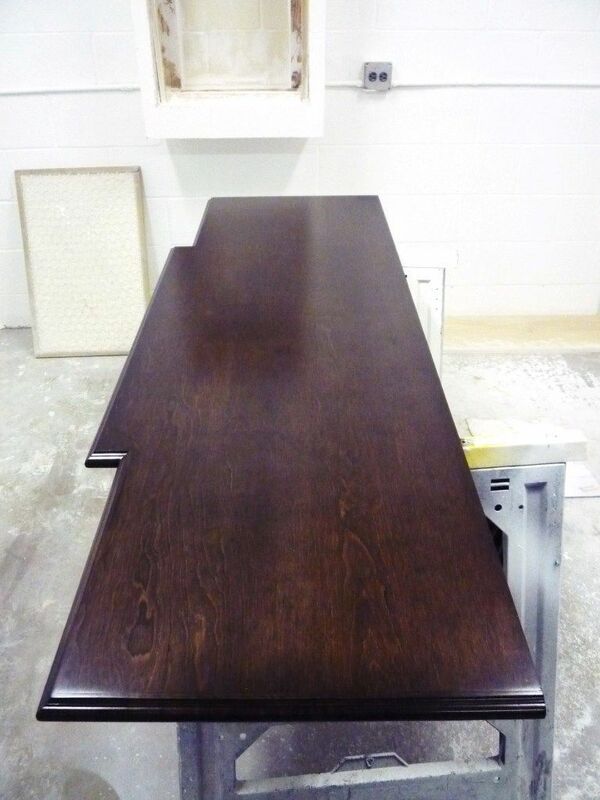 Let the first coat of lacquer dry completely before adding the second coat. Typically, the new coat will dissolve a bit of the preceding coat, allowing the two coats to mix and even out any over-spray areas. After the lacquer dries, if you find any spots that have excessive lacquer (drips, runs, orange peel, etc. ), you can lightly spot-sand with 400-grit sandpaper followed by a ​tack cloth. Add several more thin coats of lacquer. Always remember that with lacquer, less is more (so to speak). Avoid the temptation to over-apply the lacquer, as more problems are created by too much than not enough lacquer. After you have applied as many coats as you feel necessary, allow the final coat to dry for at least 24 hours. Lightly wet the surface and sand the entire finish with 400-grit sandpaper. This will dull the finish, but it is a necessary step. Follow this dulling step by buffing the surface with 0000-steel wool. This will dull the surface even more. Lightly wet the surface with some soapy water, then sprinkle on some pumice powder and, using a clean cloth (such as an old T-shirt) wrapped around a sanding block, rub the finish thoroughly. Use another clean, damp cloth to wipe down a section of the project after rubbing with the pumice mixture to check your progress. After properly rubbing with pumice, you should have the equivalent of a semi-gloss finish. For an even glossier final look after completing the pumice step, rub down the project using some rottenstone with a little bit of butcher block oil for a lubricant. The rottenstone is a much finer abrasive than the pumice and is a perfect complement to the pumice finish. Be sure not to skip the pumice step, as rottenstone won't give the same results alone. As a final step, apply a thin coat of paste wax and buff the wax to a mirror shine.